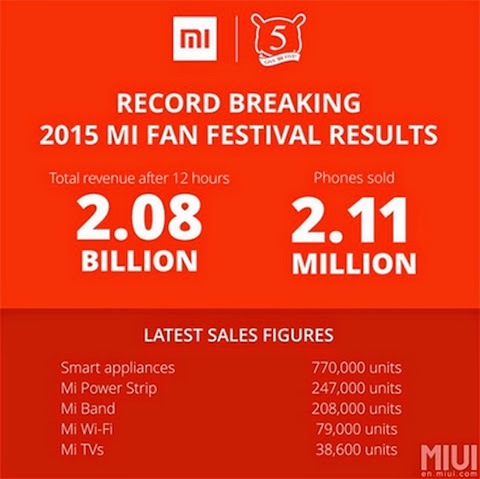 Xiaomi breaks Guinness World Record, selling 2.11M phones in 12 hours! Xiaomi sets Guinness World Record for most mobile phones sold on a single online platform within 24 hours, selling 2.11 Million phones! Xiaomi, the low-cost Chinese smartphone maker, enters Guinness World Record for selling a record breaking high of 2.11 million phones, on a single online platform and in a 24-hour period! The online flash sale was held for 12-hours as part of the Mi Fan Festival, to celebrate its 5th anniversary in the business. This brought in an astounding $355 million from sales of phones and accessories. The former holder was Alibaba Tmall which sold 1.89 million handsets in a 24-hour event last November. The figures say that Xiaomi surpassed the previous holder by 12% after twelve hours! You may have remembered last year was the meteoric rise of Xiaomi where it became the world’s Top 3 smartphone maker behind Samsung and Apple, selling more than 60 million smartphones. The Chinese maker clouded other popular brands like Lenovo, LG and HTC with its popular Redmi line of smartphones and tablets sold with affordable price tags. Pinoy Metro Geek: Xiaomi breaks Guinness World Record, selling 2.11M phones in 12 hours!